At the Swiss firm Kompaflex, where the water pressure test on the full-size rectangular bellows prototype was successfully carried out: Guillaume Vitupier and Igor Sekachev from ITER (front row) and the Kompaflex team: Werner Löhrer, CEO (centre); Remo Hribernigg, project leader; Bairush Ajeti, expediting; Antonio Coelho Soares, certified welder; and Markus Kaltenhauser, head of engineering. 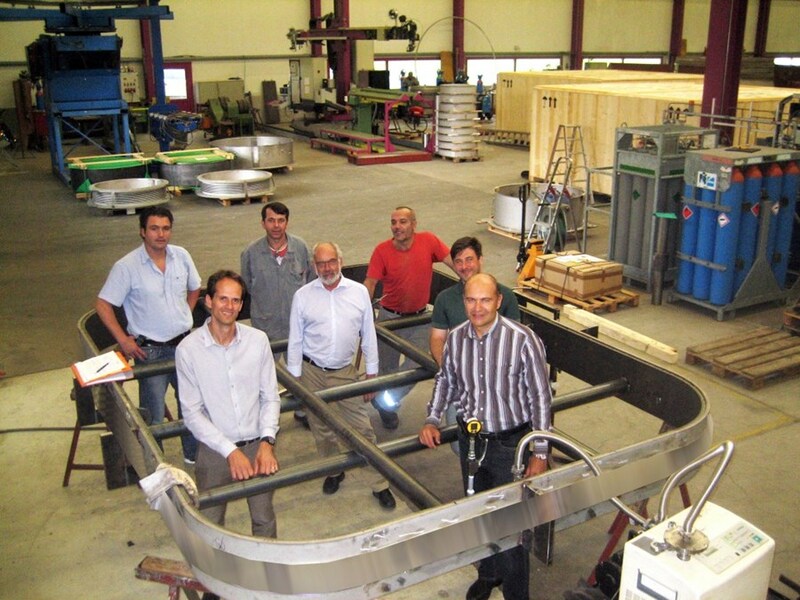 Testing has ended on a full-scale, rectangular bellows prototype at the Swiss firm Kompaflex (kompaflex ag), successfully completing the last step in the bellows design. Eighty-five large, rectangular bellows will be used between the ITER vacuum vessel, the cryostat and the walls of the Tokamak Building themselves to isolate the ultra-high vacuum inside the cryostat from the building port cell environment, and to compensate relative movement that can occur during different operational regimes like baking of the vacuum vessel, or during seismic events. On 27 August, a 3.2 x 3.6 metre prototype of the upper port duct bellows successfully passed pressure stability tests. Even in the case of the largest required pressure of 0.6.bar across the bellows—only predictable elastic deformation of the bellows was caused and following pressure relief, the bellow convolutions returned to their initial position. Only at 1bar pressure across the bellows the first small plastic deformations of 2mm were detected, which showed significant design margin to the pressure requirements. The fatigue life test of the bellows was also successfully completed. Kompaflex has the capacity to produce a multi-ply rectangular construction of bellows without welding seams in the corner area, fulfilling ITER's requirement for very short building length, enormous movements in combination with a certain number of cycles, and low spring rates. A rectangular bellows with a very short convoluted length was tested for an axial movement range of 136 mm and the requested number of 500 cycles was fulfilled without any damage. After completion of the design work on the bellows end connections, the Final Design Review for the rectangular bellows is scheduled for April 2015. The signature of the Procurement Arrangement will follow.